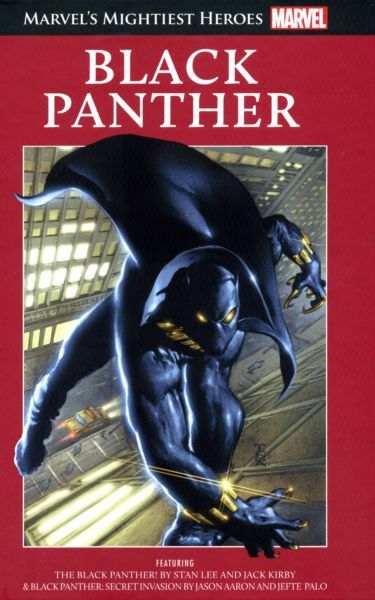 Black Panther was another of those Marvel superheroes I hadn’t really known much about before I began collecting things to do with Marvel and superheroes. I found it interesting to learn about the Black Panther. It was good to see his early story/appearance and also one of his later appearances. I found it interesting to see the contradictions in the society, between the almost primitive beliefs and the technological advances. It was interesting to see T’Challa interact with and battle the Fantastic Four. Although it’s good to see the hero who’s the main focus of the comic book, it’s also good to see the hero speak with and interact with other heroes (and villains) from the Marvel universe. I recognised Klaw from having him as part of the Marvel chess collection. It was also interesting to, again, see the differences between the artistic style in the first comics and the artistic style later on. I was a bit disappointed that the comic book was so short and that I didn’t get a chance to learn as much about T’Challa as I did the other heroes. It was also good to learn more about the history of T’Challa as a character, though he seems to have a similar run of bad luck when it comes to romance as every other superhero character. I liked seeing him and Ororo (Storm) in the second set of comics. I thought it was good that the villains in the second set of comics seemed to have been made a bit more well-rounded… villains, but with some attempt to make them view what they were doing as all right. (I have to say, part of the second set really made me cringe… since the violence there was pretty awful, no matter who it was being done to). I felt the artwork, particularly in the second set of comics, showed the effects of war particularly well and the people who lost their lives during the battle. There was a lot about the second set that really struck chords with me and drew me into a world that, although fantastical in nature, was still particularly dark. I have more of the graphic novel collection that I definitely intend to read quite soon in the future.